Having missed out on attending an FA Vase match last week, there was simply no way that I was going to miss out on the First Qualifying Round of the FA Cup this week. Not that this would be the first FA Cup match that I’ve attended in the fledgling 2018/19 season. In fact, it would be the third. The first two matches formed part of the Extra Preliminary and Preliminary Rounds. Now quite what this actually means I’m not altogether sure. Why they couldn’t have just been Qualifying Rounds 1 and 2, and then today be Qualifying Round 3, I have simply no idea. I suppose a quick Google search would soon offer a reasonable explanation to this query but, as noted in a previous post on this blog, research isn’t my strong point. I didn’t like doing it when I was studying for my GCSEs or A-Levels, so I see no reason why I should start doing it as I draw ever closer to the big 4 0! Anyway, by Wednesday I’d narrowed down my choice of games to three (5Ways soccer school in Brighton, where I coach on Saturday mornings, has restarted after the summer break, so my match choices are now limited by where I can get to in time for kick-off, and where I haven’t already been yet this season). The three games up for consideration were Hastings United vs Kingstonian; Burgess Hill vs Folkstone Invicta; and Horsham YMCA vs Tooting and Mitcham United. Unable to decide which game to attend, I hit upon a novel idea (at least someone else did; I just stole it): hold a Twitter poll and go wherever my followers decided to send me. To be honest, I expected the poll to receive no more than around ten votes. Therefore, I was amazed when it attracted nigh-on 150. Even more amazing was, at the end of it all, there was just 3 per cent between the first and third choice, with Horsham YMCA coming out on top with 35 per cent of the vote against 32 per cent for Hastings and 33 per cent for Burgess Hill. I’ll definitely be doing this again at some point. 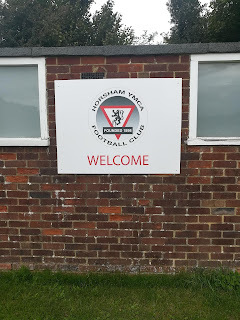 So it was that on Saturday afternoon, following a quick shower and bite to eat after coaching, I headed up the A23 towards Horsham. Alone! The first week back at school and morning football seems to have knackered the kids out and they’ve decided to stay at home with Mum… Much to her barely disguised annoyance. Being able to hear the radio for once during my journey to a game is simply bliss. Thankfully, Horsham YMCA offers onsite parking, and although I arrive at the Gorings Mead Stadium (now officially known as The Horsham Family Lawyers Stadium) with just a few minutes to spare before kick-off, there are still a few spaces. Unfortunately, the ticket ends up being slightly more than the £7 listed on the website (£10 – guess this is down to it being an FA Cup match rather than league) but this is not really a major problem. Gorings Mead Stadium itself is a fairly modest ground compared to the ones I’ve been to in the Bostik Premier in recent weeks – which I guess should come as no real surprise; they’re at a higher level in the football pyramid, after all. Not that there’s anything at all wrong with the ground. The clubhouse is definitely among the largest I’ve seen, and the main seated stand is perfectly fine, if a little on the shabby fine. There’s also a smaller terraced stand on the opposite side of the pitch, although there’s no real room for anything behind either goal. A fact alluded to by the small but vocal band of Tooting supporters who make their presence felt throughout the game. Good effort guys. One nice touch is a grassy area, complete with a small goal, where any children not enthralled by the action on the pitch can go and play – leaving their parents in peace. My kids (and me) would have loved this, so it’s a shame they weren’t in attendance for a change. Had they been it would also have possibly spared my wife the headache she’s been banging on about having from the moment I walked back through the front door. At the risk of being accused of vote fixing (I’m innocent, honest guv) I wasn’t at all disappointed when Horsham YMCA came out on top of my Twitter poll. I had attended their opening match of the season away at AFC Uckfield, which had resulted in a thrilling 4-3 victory for that day’s visitors. I was hoping for more of the same today. Well, while there may not have been seven goals, the game itself was enthralling. An open first-half was noticeable mainly for the amount of clear-cut chances missed by the visitors. The skilful Zac Coleman was a particular culprit. He spawned enough good chances to have made sure he'd be taking home the match ball (maybe even two match balls) in the first 45 minutes alone. The words ‘cow’, ‘backside’ ‘banjo’ and ‘couldn’t’ come to mind. This isn’t to say that YMCA were without their moments. It was their forward, Sam Schaaf, who went closest to opening the scoring before the interval when his shot caught the Tooting ‘keeper off his line, only for the ball to rebound unluckily off the post. So no goals in the opening 45 but plenty of entertainment. And the entertainment only intensified in the second half. After Coleman had missed yet another good chance to open the scoring, it was the hosts that took the lead. Substitute Dean Bown, on for the injured Schaff, showed remarkable composure in the area to hold off a couple of challenges, and finish calmly when under pressure. Coleman almost equalised immediately only for his best effort of the day to be brilliantly turned away by Horsham custodian Aaron Jeal. However, an equaliser wasn’t long in coming. From a corner, imposing centre half Lex Beeden’s header looped over the stranded Jeal and into the net (see video). If, like me, the rest of those watching now expected the higher division side to dominate proceedings, we couldn’t have been more wrong. 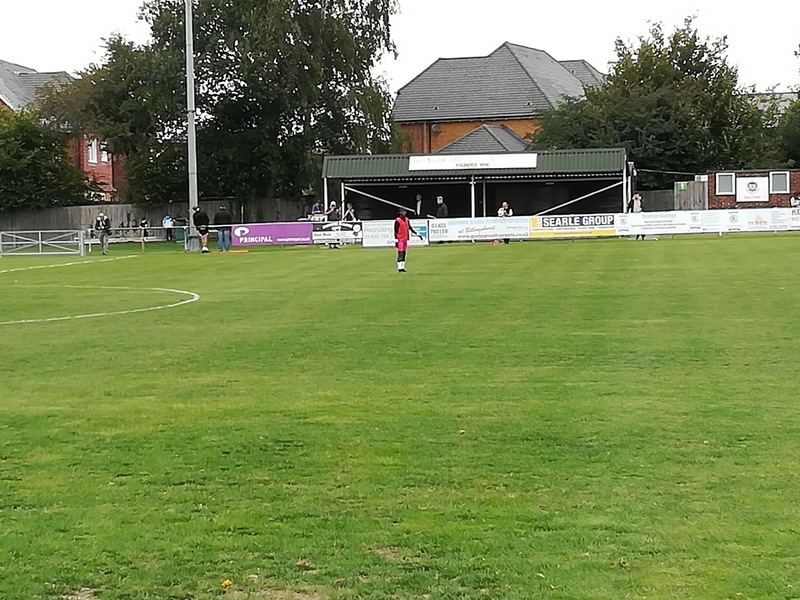 Two rash (and rather silly) challenges from Tope Fadahunsi led to the Tooting player being dismissed and the home side suddenly sensed blood. 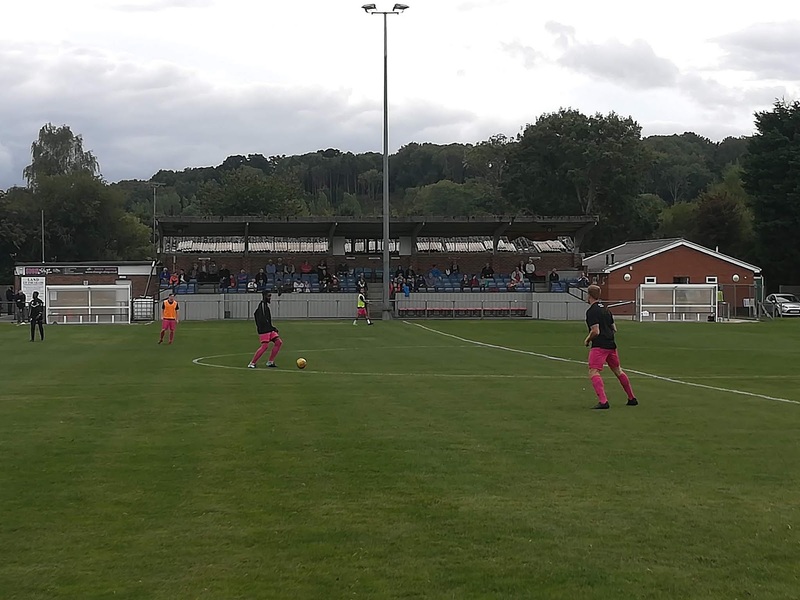 Alex Barbary twice came close to restoring YMCA’s lead with well-struck efforts before Dan Evans’ brilliant last-minute long-range strike was superbly saved by Liam Sallis. It would turn out to be a hugely important save for two reasons. Not only did it keep his side ahead with time running out, but from the resulting corner the Terrors broke, and the ball was eventually worked to Eli Simpson who showed the sort of composure that had been sorely lacking from some of his teammates all afternoon, to finish calmly and send his team into the next round. Come the final whistle the contrast in emotions was stark. YMCA players slumped to their knees, absolutely gutted that their FA Cup dreams have come to an end for another season; Tooting players punching the air, hugging in sheer delight, looking forward to finding out who they’ll be facing in the next round. As I made my way back to my car, walking behind the high-spirited Tooting fans, it was impossible to not to hear them singing that famous old FA Cup ditty Que Sera Sera at the tops of their voices. Wembley may be a long way off (there’s still three more qualifying rounds to go before the first round proper) but for Tooting and Mitcham United the FA Cup dream lives on for another few weeks at least. Good post. I also enjoyed the game having chosen it for a random FA Cup game.